I should probably try to blog more that once a year? yeah I should. I'm sorry. I've returned to my former rather reclusive state and blogging is kinda putting yourself out there and..yeah. 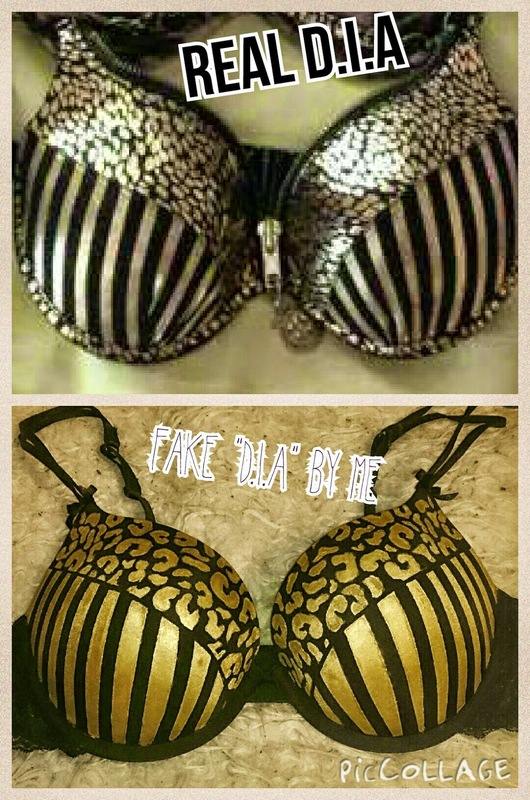 I was bored yesterday and decided to bling up one of my black H&M bra's because why not? first I looked for inspiration pictures online and the one I found was originally a bra I did want to buy from Petit Egoist ,but it was already sold out. Fill it in but be careful not to go over the tape on the top! After making the stripes on both sides with 2 layers of paint I found my leopard stencil,cut it up into a smaller section and held it over while I gently went over with fabric paint. Patience was key here as stencils are better used on flat surfaces and a bra just isn't that. Also,don't forget to put half an inch/1cm of tape around the area of stripes so they don't bleed into each other! Semi finished result. I'm still going to add some bling to it. rhinestones,a chain,a zipper like the original or something like that. Pro tip! the bigger the stripes,the bigger your bust will look. if you want a smaller bust you should opt for thinner stripes of gold. Yes I know this isn't D.I.A but it's something. And for those who cant fit into them,whether they're petite or extravagant in the breast department,this is a nice tip on spicing up the childish snoopy/hello kitty bras or the dull solid looking ones from the maternity section.